She holds all of your love in her tiny little hands, and you are simply "over the moon" for her. This teeny tiny moon pendant is made with solid 100% 14k white gold and is set with a stunning micro diamond. Nothing would make a more perfect gift for the little girl who is your sun, your moon, and all of the stars. 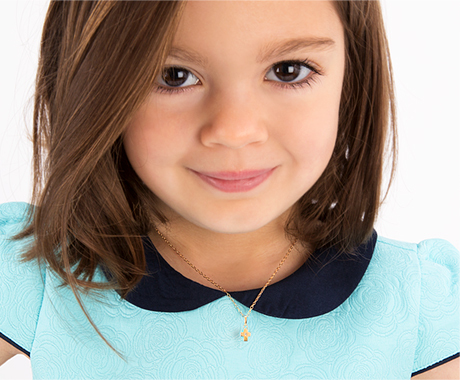 Exquisitely gift wrapped in our signature blue box with keepsake pouch and certificate of authenticity, you can be sure this tiny necklace will get big ooh's and ahh's! This teeny tiny moon is so sweet, perfect for the little girl you are just "over the moon" for! A mini diamond moon she will treasure as long as there are stars in the sky.